I came across an interesting article on the Forbes Magazine website last week illustrating a shift in the way many in society are understanding the concept of disability. The article is largely taken from an interview with Dan O’Connor of the Berman Institute of Bioethics at Johns Hopkins University following a U.S. Department of Justice ruling that a Massachusetts university is required under the Americans With Disabilities Act to provide gluten-free meals to students with celiac disease who have no choice in purchasing the university’s meal plan. 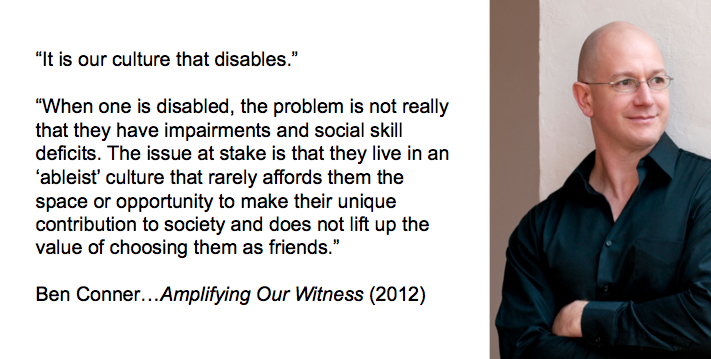 Here are two quotes from Dr. O’Connor that help illustrate the paradigm shift in how some are viewing disability…and the opportunities and challenges the new thinking presents to those serving in the disability ministry movement. The child with combined type ADHD expected to sit still and demonstrate self-control for an extended period of time in uncomfortable clothes and seating through worship services with content designed for adults. The self-conscious teen who experiences difficulty picking up on nonverbal social cues who becomes resistant to attending small groups in the homes of unfamiliar peers and adults. As more and more people in society (and the church) recognize the contributions our environments make to conditions our society recognizes as disabilities, we have an opportunity to rethink our paradigm of how we minister to kids and families with disabilities. We can ponder how we can create ministry environments where kids with “neurodiversity“…differences in how they process sensory stimulation as well as verbal and non-verbal language, differences in ability to self-regulate emotion and behavior, differences in how they perceive threat or risk…and their families can thrive as they learn about Jesus, come to faith in Him and grow in faith in Him. Accomplishing this is not without overwhelming challenges. Every church has a contingent of people who are adamant about doing church “the way we’ve always done it.” Any attempt to change ministry environments will be met with resistance (think about how worked up folks get about the music at church!) and has to be done in a way that those environments continue to appeal to kids and families who are “neurotypical” and most importantly, our ministry environments need to fulfill their primary purpose… helping kids and parents to come to know Christ and to grow in Christ. Our Key Ministry team will be hitting the road to be part of the 2013 Accessibility Summit, hosted by McLean Bible Church in suburban Washington D.C. on April 19th-20th. This year’s Summit features Emily Colson (daughter of Chuck) As an artist, author, and speaker, Emily is passionate about inspiring others to persevere through their challenges and appreciate life’s gifts. In her book Dancing with Max, she and her late father share the struggle and beauty of life with Max, Emily’s son with autism. For more on our Key Ministry presentations, click here. For more information on the Summit and registration, click on the Summit logo to the right. This entry was posted in Families, Hidden Disabilities, Inclusion, Key Ministry, Ministry Environments and tagged Disability, Disability Ministry, Dr. Dan O'Connor, environments, Inclusion, Key Ministry, ministry environments, neurodiversity, Special Needs Ministry. Bookmark the permalink. Bravo, Steve! Excellent, excellent post!